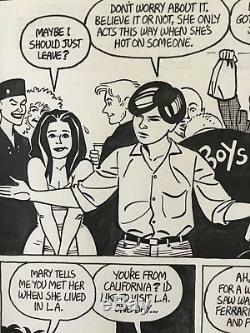 This page, page 5 or Love & Rockets #33, is from the first part of the seminal story of the series'Wig Wam Bam! 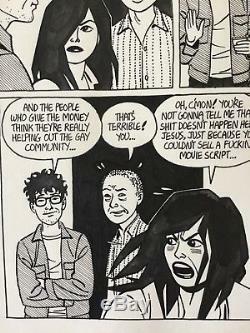 It features both Maggie and Hopey at her most foul-mouthed, and is one of the rare pages from this storyline where they both appear together. I don't know if any one page sums up a series, but Maggie, Hopey and friends at a party pretty much says it all. 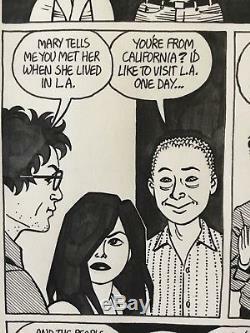 The series so accurately chronicled a post-punk world that at times felt true to life, and at times felt like'One Hundred Years of Solitude'. This page is in excellent shape. A little white-out touch ups. What a great series this was, and Jaime's clean, strong artwork is amazing to see up close. 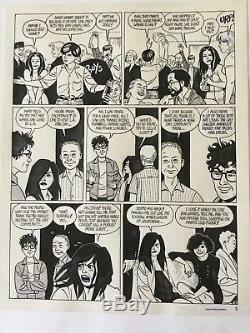 The item "LOVE & ROCKETS #33 JAIME HERNANDEZ ORIGINAL COMIC ART PAGE! WIG WAM BAM" is in sale since Wednesday, July 4, 2018. This item is in the category "Collectibles\Comics\Original Comic Art\Interior Pages". The seller is "grailpages" and is located in Chicago, Illinois.